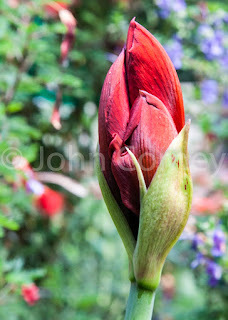 My spring garden is proving to be fertile ground for flower photography this spring. Here in southern California our climate is so mild that we can grow amaryllis lilies outside all year round, unlike many places. They really thrive here, actually. This beautiful deep red amaryllis, which I just planted last autumn, is pushing forth its first bud.